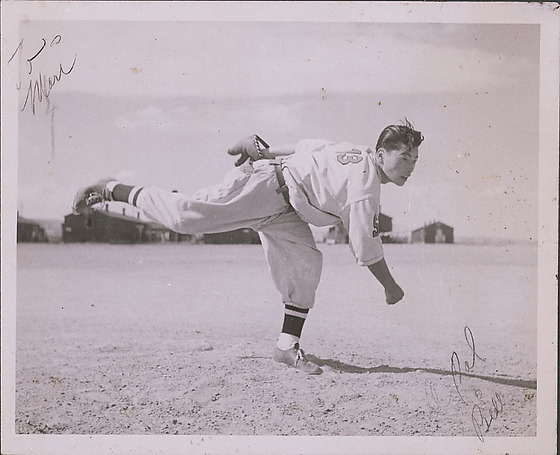 Young man, Bill, bent at the waist as he follows through a pitch in baseball at Heart Mountain concentration camp, Wyoming, 1944. His body is horizontal to the ground as he stands on one leg and extends proper right leg back to left edge ; right arm swings across his body toward ground with left hand in glove extending back. He gazes toward right edge. Young man is dressed in full baseball uniform with number 13 on back. He is hatless and hair is combed back. Shadow extends to right edge. Barracks in background. Written in black ink on image: To Mori / A Pal / Bill.